Before I go into my card details I want to show you the scraps that I used for making it. The second picture shows how I attached the pieces first on a white scrap paper square that acted as a template. Ennenkuin menen itse kortin esittelyyn, kuvassa ovat silput, joita käytin kortin tekemiseen. Toisessa kuvassa näkyy myös valkoinen kopiopaperista leikattu neliö, johon silput kiinnitin ja joka toimi pohjana/mallina. 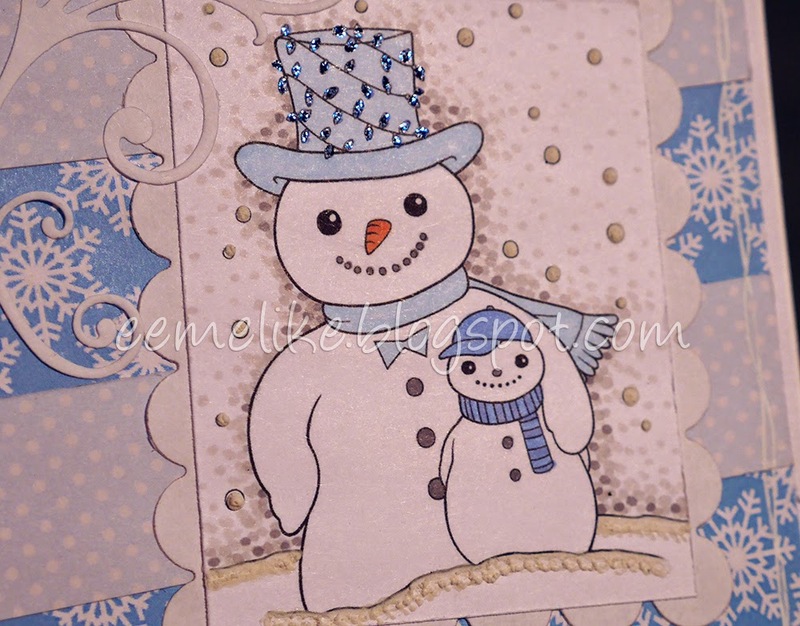 On my card I used a cute digi stamp called Snowman and Son and it is from our sponsor Lemon Shortbread. Image is cut with a knife (and ruler) to fit inside a scalloped die-cut frame (die: Spellbinders) which was originally square but with a little bit of magic it turned into its new shape. Coloring is done with ProMarkers, on the tiny baubles I added midnight blue Stickles and snow effect is made with a snow markers (heated for *puff* -reaction). White swirl is cut with a Die-namics die and on the edges I doodled fake-double-stitching with white gelly roll pen. Kortissani käytin sponsorimme Lemon Shortbreadin söpöä digileimaa nimeltä Snowman and Son. Leikkasin kuvan askarteluveitsen ja viivottimen avulla suorakaiteeksi ja kiinnitin piparireunaiseen yksilöön, joka oli alunperin neliönmallinen, mutta pienellä väkerryksellä, sai uuden muotonsa (neliöstanssi Spellbindersin). Kuva on väritetty promarkereilla, pikkuruisissa palluroissa on lisäksi Sticklesin midnight blue -sävyistä kimalleliimaa, ja lumiefekti on luotu snow marker -kynällä (*puff* -reaktiota varten kuumennettu kuumailmapuhaltimella). Valkoinen kiekura on stanssattu Die-namicsin stanssilla ja reunoille on piirretty valetuplatikkaus valkoiselle gelly roll -kynällä. Ein sehr schönes Werk. Danke für die Teilnahme bei den Kreativeinkauf-Challenge. 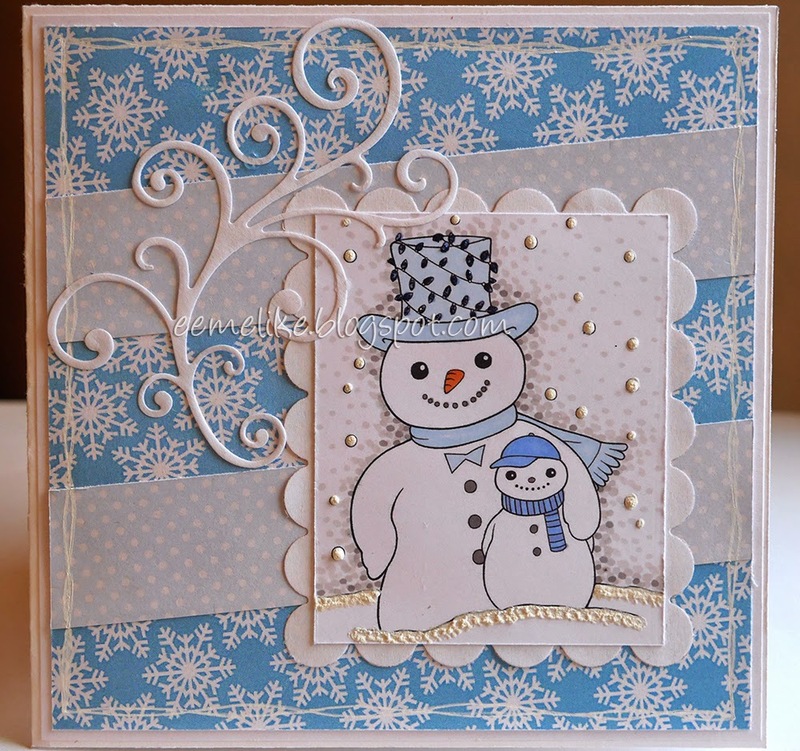 Fabulous Christmas card.Thank you for joining us at Card Mania Challenge. Darling card with those sweet snowmen! So excited that you joined our Winter Wonderland challenge at Cupcake Inspirations! This is gorgeous, I love the image and fabulous colours. Thank you for taking part in the Passion for Promarkers Mega Christmas Challenge. Pretty card. Love the "lights" on the top hat. Beautiful card! Awesome coloring! Thanks for sharing it at Cupcake Inspirations Winter Wonderland challenge. Happy Holidays! You have made a really festive project for our month-long challenge at Pile It On, love this sweet stamp. Thank you for joining us and don't forget to check on Wednesday who's the winner. Good luck and best wishes for the new year!